Some time ago we got this old Russian cartoon from our language teacher called Жил-был пёс (zhil-buil pyos) – There Once Was a Dog. I found it lying around on the hard-drive again today and thought I’d share it. It’s a great little story based on a Ukrainian folk tale. Beyond being a fun little tale, I think it shows the “take care of your friends” ethic that Ukrainians have. The human characters in the Russian-made cartoon also poke fun at Ukrainian peasants. Here’s a nice English-subtitled version. Teachers donning their protective masks in the teacher's lounge. Emma and I are in week 2 of our 3 week national “quarantine”. 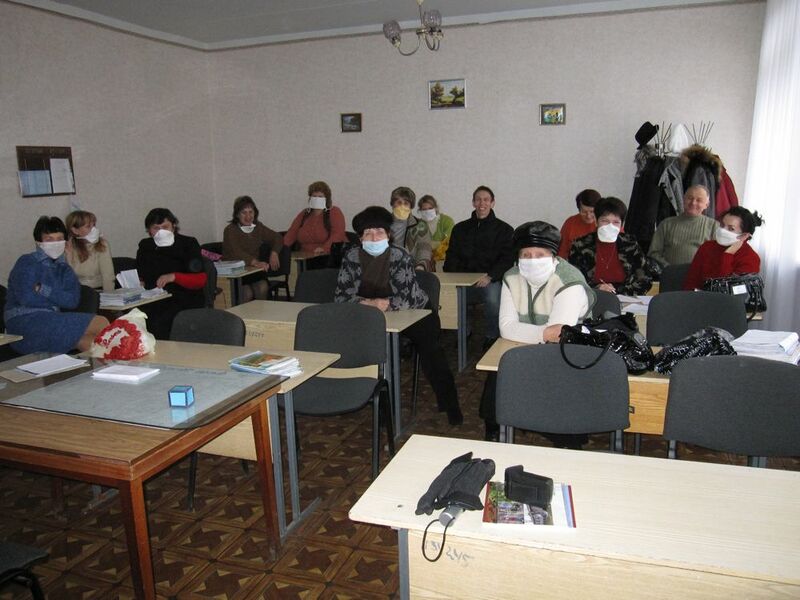 An outbreak of Swine Flu in the western part of Ukraine led the government to cancel classes in every educational institution in the country. So we have 3 weeks off! Well, not exactly. My school had already scheduled a “fall break” for last week during which teachers work, students stay home, and they crank up the massive central heating unit to slowly warm up the school for winter. So, ironically, the first week of my “flu-cation” was robbed by a fall “break” during which I still had to go to work. Oh well, такова жизнь (takova zhizn) – that’s life. Emma was working hard on and just sent in a PEPFAR (HIV/AIDS project) grant proposal. She wants to build a nice resource center at the Lyceum where kids will want to hang out and where she can do HIV/AIDS trainings. Now I’m working on a “Small Projects” grant to get some sports equipment and start a sports club. So, to keep myself from relaxing too much, I’m trying to get that largely finished before classes kick back in and the swine flu finally gets passed around. On my way to school this morning, I walked under a tree (maybe a Chestnut) that was dropping it’s big leaves like they were going out of style. Every tree around it was already bare, but this one had kept most of its leaves until today. We had our first serious frost last night which I suppose gave it a wake up call. There was no wind. There was just the sound of hundreds of leaves landing in a nice big pile. It was one of those little moments of amazement that life surprises you with every so often. Sometimes, locals will tell us how our town has nothing much interesting or beautiful to offer. Maybe one of the blessings of our life here is that many “ordinary” Ukrainian things are new and beautiful to us.